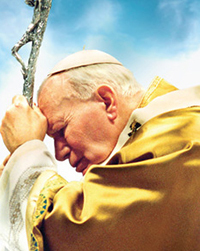 O, St. John Paul, from the window of heaven, grant us your blessing! Bless the church that you loved and served and guided, courageously leading it along the paths of the world in order to bring Jesus to everyone and everyone to Jesus. Bless the young, who were your great passion. Help them dream again, help them look up high again to find the light that illuminates the paths of life here on earth. May you bless families, bless each family! You warned of Satan’s assault against this precious and indispensable divine spark that God lit on earth. 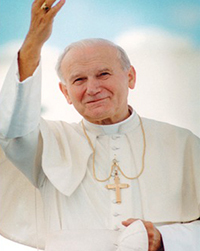 St. John Paul, with your prayer, may you protect the family and every life that blossoms from the family. Pray for the whole world, which is still marked by tensions, wars and injustice. You tackled war by invoking dialogue and planting the seeds of love: pray for us so that we may be tireless sowers of peace. 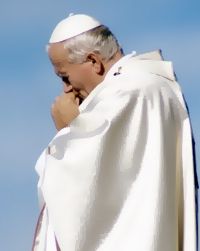 O St. John Paul, from heaven’s window, where we see you next to Mary, send God’s blessing down upon us all. Amen. 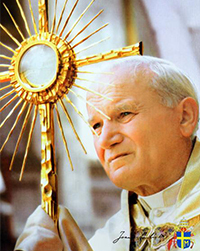 O Blessed Trinity, we thank you for having graced the Church with St. John Paul II and for allowing the tenderness of your Fatherly care, the glory of the Cross of Christ, and the splendor of the Spirit of love to shine through him. Trusting fully in Your infinite mercy, and in the maternal intercession of Mary, he has given us a living example of Jesus the Good Shepherd, and has shown us that holiness is the necessary measure of ordinary Christian life and is the way of achieving eternal communion with You. So, as we start our nine days with you, thank you for reminding me that with God’s Help, I can start again, but I need to start now, not at some point in the future. Your words are encouraging and motivating to me. Please be with me as I progress through these nine days in prayer with you. Never , ever give up on hope, never doubt, never tire, and never become discouraged. Be not afraid.” With your help, I will not give up my hope, I will be persistent and unafraid. Simply step out fearlessly knowing that I am with you, therefore no harm can befall you; all is very, very well. Do this in complete faith and confidence.” What more can I say, but thank you for your confidence in me. Help me have complete faith in God. 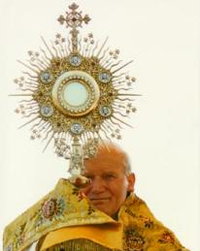 Stand with me at all times as my intercessor and spiritual guide until I get to Heaven. 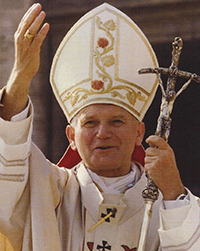 Dear St. John Paul, just like St. Paul who described his journey as a race, you tell me that life with Jesus is a wonderful adventure. Life is not a sprint for me, but rather a winding marathon with its curves and its ups and downs. Help me by being with me at all times as I struggle in this race toward Christ. 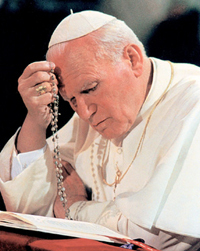 “Do not abandon yourselves to despair. We are the Easter people and hallelujah is our song.” Let me be joyful on this wonderful adventure. Let me always have a true Christian joy in my path in life. Help me always be doing the Will of God in my life. 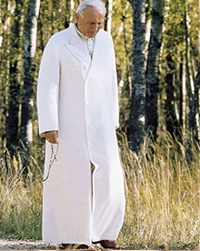 Dear John Paul, you tell us, just as Christ did, the Golden Rule. How simple it is to hear, yet so difficult, at times, to do. Be with me and help me see God in my neighbor, and in those I find unbearable. 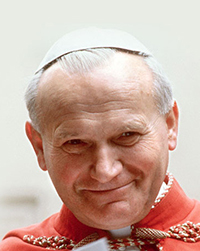 Each one singly and altogether — to lead us across the boundaries of time to the eternal embrace of the God who loves us.” Help me, dear St. John Paul to remember that God is the end-all. In every moment of my life, I need to be focused on my life with Christ, so that when my earthly life ends, my eternal life can begin with Jesus. Rightly, then, you thirst for happiness. Christ has the answer to this desire of yours. But He asks you to trust Him. True joy is a victory , something which cannot be obtained without a long and difficult struggle. 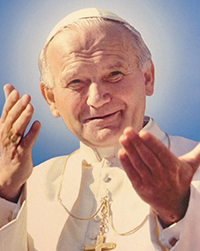 Christ holds the secret of this victory.” Dear St. John Paul II, once again, you in simple words tell us that God is our victorious Savior; nothing is more important life with Him. Your motto was “Totus tuus”, or “Totally yours” (of the Blessed Virgin Mary). 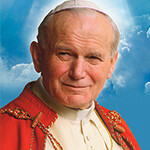 Dear St. John Paul, the surest, straightest road to Christ is through His Mother. When I am lost in life’s brambles, ask Our Lady to come rescue me and bring me back to the road that Jesus wants me on. Teach me your love for Mary. The Lord Jesus will reveal Himself to each one of you, that He will give you the strength to go out and profess that you are Christian, that He will show you that He alone can fill your hearts. Accept His freedom and embrace His truth, and be messengers of the certainty that you have been truly liberated through the death and resurrection of the Lord Jesus. This will be the new experience, the powerful experience, that will generate, through you, a more just society and a better world. 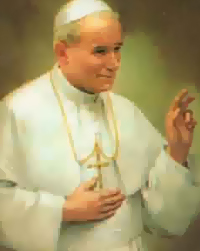 O God, who are rich in mercy and who willed that the blessed John Paul the Second should preside as Pope over your universal Church, grant, we pray, that instructed by his teaching, we may open our hearts to the saving grace of Christ, the sole Redeemer of mankind. Who lives and reigns with you in the unity of the Holy Spirit, one God, for ever and ever. Amen.